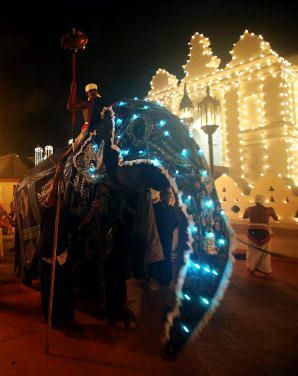 Sri Lanka's Festival of the Sacred Tooth is one of the oldest and grandest of all Buddhist festivals, featuring dancers, jugglers, musicians, fire-breathers, and lavishly decorated elephants. The date of the ten-day observance is determined by the lunar calendar and usually occurs in July or August. Today's festival contains elements of Hinduism as well and possibly is more of a national holiday than a religious one. This article will focus mostly on the most Buddhist feature of the festival -- the Buddha's tooth. This story begins after the Buddha's death and Parinirvana. According to Buddhist tradition, after the Buddha's body was cremated, four teeth and three bones were sifted from the ashes. These relics were not sent to the eight stupas built to keep the remains. Exactly what happened to these seven relics is a matter of some dispute. In the Sinhalese version of the story, a left canine tooth of the Buddha's was given to the King of Kalinga, an ancient kingdom on the east coast of India. This tooth was enshrined in a temple in the capital, Dantapura. Sometime in the 4th century, Dantapura was threatened by war, and to keep it safe the tooth was sent to Ceylon, the island nation now called Sri Lanka. The King of Ceylon was a devout Buddhist, and he received the tooth with boundless gratitude. He placed the tooth in a temple in his capital. He also declared that once a year the tooth would be paraded through the city so that the people might give it honor. A Chinese traveler witnessed this procession in about the year 413 CE. He described a man riding a gorgeously decorated elephant through the streets, proclaiming when the procession would begin. On the day of the procession, the main street was swept clean and covered with flowers. The celebrations continued for 90 days as both laypeople and monastics participated in ceremonies venerating the tooth. In the centuries that followed, as the capital of Ceylon moved, so did the tooth. It was kept near the residence of the king and placed in the most beautiful temples. After an attempted theft in the 7th century, the tooth always was kept under guard. Now the tale of the tooth takes several alarming turns. Early in the 14th-century invaders from south India seized the tooth and took it back to India. Remarkably, the tooth was recovered and returned to Ceylon. Yet the tooth was not safe. In the 16th century, Ceylon was taken over by the Portuguese, who went on a rampage destroying Buddhist temples and art and artifacts. The Portuguese took possession of the tooth in 1560. The King of Pegu, an ancient kingdom that is today part of Burma, wrote to the Portuguese viceroy of Ceylon, Don Constantine de Braganza, offering vast amounts of gold and an alliance in exchange for the tooth. It was an offer Don Constantine almost couldn't refuse. But wait -- the Archbishop of the region, Don Gaspar, warned Don Constantine that the tooth must not be ransomed back to "idolators," but must be destroyed. The heads of the local Dominican and Jesuit missions weighed in and said the same thing. So, a no doubt grumbling Don Constantine handed the tooth over to the Archbishop, who smashed the tooth to powder with a mortar. The tooth-bits were then burned, and what bits remained were tossed into a river. The Buddha's tooth today is housed in honor inside the beautiful Temple of the Sacred Tooth, or Sri Dalada Maligawa, in Kandy. Inside the temple, the tooth is kept inside seven gold caskets, shaped like stupas and covered in gemstones. Monks perform venerating rituals three times daily, and on Wednesday the tooth is washed in a preparation of scented water and flowers. The Festival of the Tooth today is a multifaceted celebration, and not all of it is related to Buddhism. The modern festival is a combination of two celebrations, one honoring the tooth, and another honoring the old gods of Ceylon. As the procession passes by, thousands of people line the streets, enjoying the spectacle, the music, the celebration of Sri Lanka's culture and history. Oh, and honoring a tooth. What Are Hungry Ghost Festivals?